Reported earlier as UFE and identified by Jaume Ollé, I add this for a description. 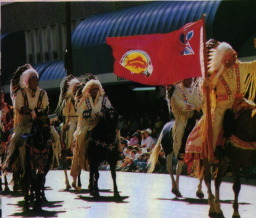 Healy's works on the Flags of the Indian Nations shows this as having a white background, with the British Union in the canton and the Tribal Seal as a badge. The photographs posted to the list show a red background and a local variation of the Union flag, cropped, extending upwards to in the form of a teepee, and smaller than a normal Union flag in the canton.